When President Obama was campaigning and was elected, I gave little thought on what Michelle's impact on me would be. I was confident that President Obama would help rebuild the America I was raised to love, but had no idea how in love I would fall for Michelle. 10. She is an example to women around the world that you can do it all. Having a career and family is attainable. 9. She bares her arms! I love that she is proud of her body and shows it off in the manner she wishes. She works hard to tone those arms! 8. She's uber smart. A practicing lawyer with a big career, not just a supportive wife and baby maker. 7. She is my generation's Jackie Kennedy. A young mother, fashionable, vibrant, and interesting. Not just some old hag in her pant suit. 6. I love, love, love her fashion. From the cardigans to the Jason Wu gown inaugural gown. Silly reason? Yes. But, I don't care! I'm a girl and girls love clothes! 5. I love that she is open about the issues her and President Obama have had about balancing work and family. These are issues most women can relate to, and it makes her more relatable to us. 4. She planted an organic garden on White House grounds. As a big city girl, I have to say it has been a fantasy of mine to have a garden and I'm completely jealous! 3. She has a genuine factor. I love her laugh, her smile, the way she teases President Obama, the way she looks at her girls, and everything else I see her do. At times I can agree with certain criticisms, but I can't deny that she is just being herself. 2. She wears sneakers! 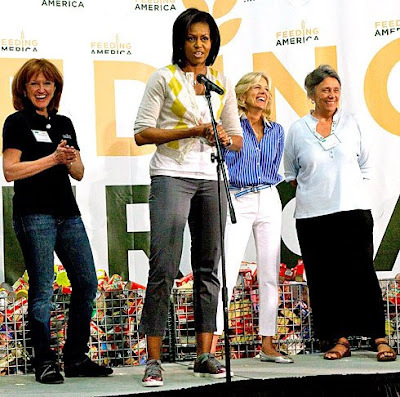 There was somewhat of an uproar when our First Lady showed up to an event with sneakers on. The horror!! Real women, obviously, wear heels 24/7...therefore, so should our First Lady! She was born middle class and worked her way up in life. There is something to be said about people who aren't handed their futures, and actually earn them through sacrifice and hard work. As a middle class girl, she is a fantastic role model!